Following a small teaser last week, the team behind Halo fan game Installation 01 have released their first Q&A video, discussing elements of the game’s multiplayer. Answering questions from fans, the team talk about how players can customise their Spartan, whether they are designing a more Bungie or 343-esque Halo game, among other things. Head down the virtual gun range with our list of the PC’s top shooters. While still in the stages of pre-alpha, Installation 01’s multiplayer will look familiar to anyone who has played a Halo game. The design team are trying to follow the design standards set by Bungie, using Halo 3 as its template, rather than the modern entries by 343. While they are considering adding in elements like Halo 5’s sprint in custom games, Installation 01 is primarily focused on continuing Bungie’s design legacy. As such, the weapons are not hitscan based like in Halo 5, but traditional projectile weapons like the ones seen in Halo 3. The team initially started with hitscan weapons, but it made guns like the Sniper Rifle way too accurate. 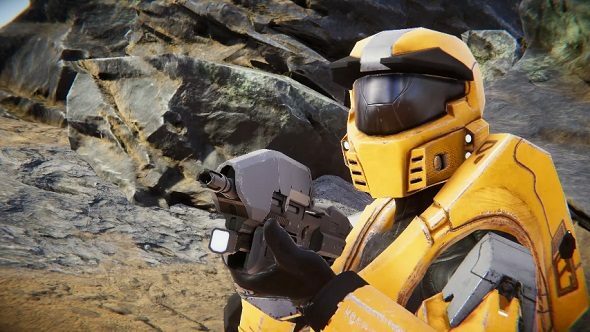 For armour customisation, Installation 01 allows Spartans to customise their helmet, chest, arm and leg armour, with players then being able to choose their primary, secondary and visor colours. So far, only the Mark V and Mark VI armour are in the game, but the art team are planning armour variants, alongside possible cosmetic attachments and armour skins. There are plans for both skill and in-game credit unlocks for armour pieces, with Spartans unlocking new armour as they level up. Speaking of level ups, Installation 01 plans to have a ranking system similar to that seen in Halo 3 and Reach, where players have both linear and skill based ranks. This Q&A also shows off the Installation 01 website, which harkens back to the old Halo website that fans were so fond of back in the days of Halo 3 and Reach. It plans to have stuff like file sharing for custom games and replays, an extensive forum, along with the ability to customise your Spartan armour through this dedicated website. This will also be the place where you download the Installation 01 launcher, meaning that the game is planned to run independently from a service like Steam. All game updates will come through this launcher, centralising everything to do with Installation 01. Everything seems to be progressing nicely for Installation 01, but time will tell on whether it will morph into its own game, or stay as a Halo fan project. While all of the assets are hand-made by the Installation 01 team as to not violate Microsoft’s Game Content Usage Rules, there is a question of whether it will go the route of Galaxy in Turmoil and become a brand new IP. Make sure to keep checking the Installation 01 website, as that will be the place to get all the latest news and eventually access the game, once it is available to the public.